He's the king... of the whole wide world"
Ever since he released his first major label single - "Heartbreak Hotel" on RCA - in 1956, Elvis Aron Presley has been widely acknowledged as 'The King Of Rock ‘n’ Roll.' It is not a title that he chose, nor have I ever read or heard him refer to himself as the 'king' of anything. However, it is a title bestowed upon him by the press, his fans and just about everyone else in the known universe. It is a badge that I’m sure he wore proudly at times in his career, but it was also a burden to try to live up to, especially since his talents were far more versatile than that nickname suggests. It is also a moniker that ensured that Elvis would have to endure endless mocking by those who now look at his ‘60s and ‘70s output as anything but Rock ‘n’ Roll. It would seem that many have forgotten the man and his music, chosing to focus purely on the 'myth of Elvis'. While a simple blog post cannot properly describe or define Elvis, I've chosen to devote a few words to steer you away from the more sensational aspects of his personal life (i.e. : rumors and gossip) and encourage you to refocus on the man's musical career. 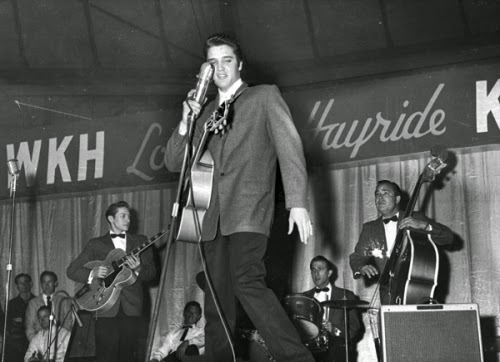 Beginning with his first RCA single – “Heartbreak Hotel” in January of 1956 – Elvis went from being an up and coming Hillbilly/Country artist to Rock ‘n’ Roll’s first real superstar. When people refer to him being the ‘King Of Rock ‘n’ Roll,’ this is the period they are talking about. It was a period that lasted a little less than five years, but it changed the course of music. Almost everyone knows “Hound Dog,” “Don’t Be Cruel,” “Blue Suede Shoes,” etc. Although he never toured overseas, his records were enormous hits in almost every corner of the world. Elvis was unique. Elvis was different. The kids loved his look and sound but the adults found him offensive – just as it should be in Rock ‘n’ Roll. 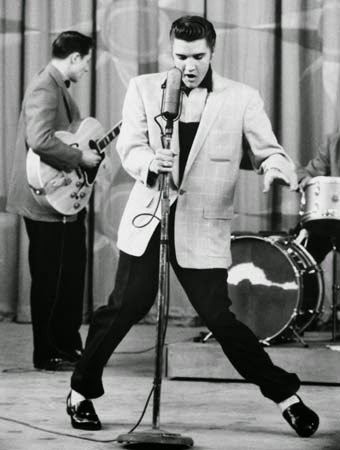 However, Elvis was humble and down to earth and that came through during his TV performances, which caught the attention of viewers of all ages. Whether he was loved or hated didn’t matter – he was selling records and influencing a new generation. He made some movies – Love Me Tender, Loving You, Jailhouse Rock and King Creole – and was even drafted by the U.S. Army and spent the last two years of the decade overseas in Germany, yet his popularity never waned. Elvis seemed to be unstoppable. 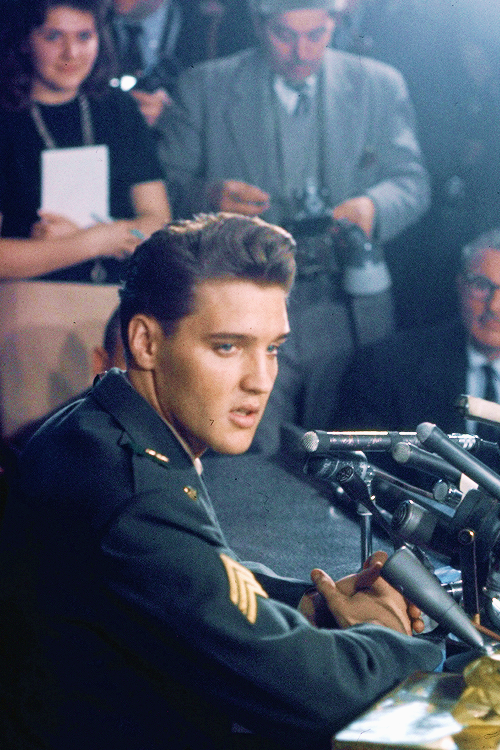 When Elvis was discharged from the Army in 1960, he received a hero’s welcome. The press went wild, Frank Sinatra hosted a TV special in his honor, and he was thrust back into the studio to pick up where he left off. Plans were also put in place to resume his movie career. However, something was different. While Elvis had been away in Germany, Rock ‘n’ Roll had become an accepted form of musical expression so he was no longer considered ‘dangerous’ or ‘controversial.’ And in those two years, Elvis had lost his mother and matured, leaving his primal Rock ‘n’ Roll instincts behind and embracing a sound that was deeper and more meaningful to him. Yes, it was still Rock ‘n’ Roll, but it was more controlled, more thoughtful and more emotional. He was singing better than ever and the Gospel and Country that he loved growing up began informing the music that he made. Elvis shaped a new sound for himself and set his sights on growing as an artist, as an actor and as a human being. Elvis made two films in 1960 alongside his Elvis Is Back album, but it wasn’t until ’61 that his focused shifted away from the studio and onto the silver screen. That year, Blue Hawaii was released and it was a turning point for Elvis – the hit movie helped the soundtrack sell millions of units around the world and convinced everyone that his movies were better at promoting his albums than his concert tours were. So, apart from one benefit show, Elvis did not play in front of a live audience again until 1968. In the meantime, he recorded a lot of soundtrack music, made a lot of movies and sporadically recorded non-soundtrack sides that would be released between soundtracks. This was the period of time that most critics consider his first downfall. The truth is, a lot of the soundtrack recordings were lightweight and often embarrassing, but Elvis almost always sounded great. It was obvious at times that his heart was not in it and he was sleepwalking through many of the songs, but there are some absolute gems that made it all worthwhile. A lot of people forget that “Return To Sender” and “Can’t Help Falling In Love,” two of his most familiar ‘60s hits, were from soundtracks. Other top notch tunes include “C’mon Everybody,” “I Got Lucky,”, “I’ll Take Love”, ‘Viva Las Vegas,” “King Of The Whole Wide World,” and many more. They may not have been on the same level as his ‘50s hits, but they were recorded under different circumstances and in a very different time. There are real gems to be found during this phase in his career, although you do have to have a little bit of patience and get past songs like “Old McDonald” and “Do The Vega.” Remember this, though: Elvis cut some amazing non-soundtrack recordings during this time and the power in those cannot be denied. But alas, the studio became his part-time job and movies became his day job! By the end of ’67, record and movie ticket sales had dropped and Elvis was no longer embraced by the music industry. His movies were fun but formulaic, just like the music. He started putting more energy into his non-soundtrack recordings and while they weren’t scaling the charts, he was sounding more connected to the music than he had since 1960. Since there was no interest in his movies or records at this point, Colonel Parker decided it was time that he returned to the medium that helped create the legend a decade before: TV. 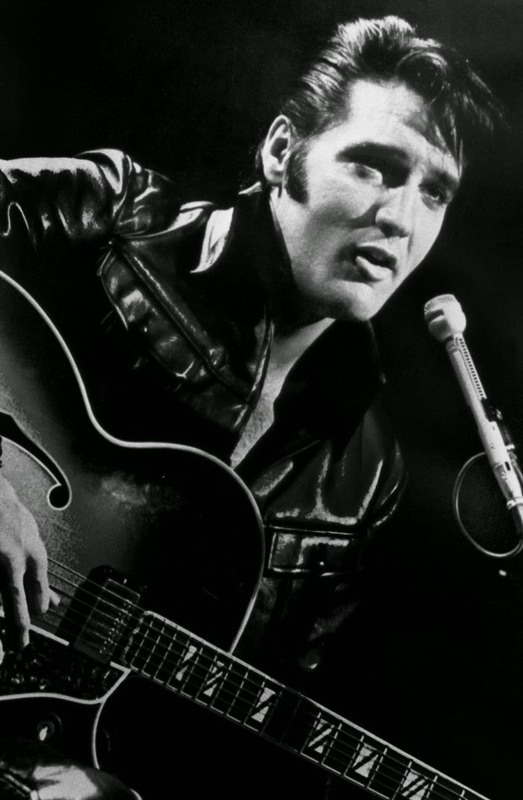 The 1968 Elvis television special is now called The ’68 Comeback Special for a reason: it rejuvenated his career in a big way. The TV special showcased an artist with a fire in his belly that seemed to have been missing for years. With a new look, Elvis blew everyone away with a variety of songs old and new. 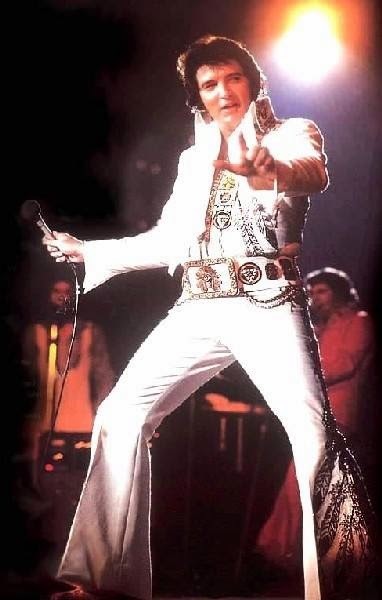 With much of it filmed in front of a live audience, Elvis was filled with nervous energy – it was a stunning return to form. Suddenly, everyone who saw it was an Elvis fan again. He still had a few movies left on his contract so he filmed those while focusing more on studio work into 1969. His sessions in Memphis are now legendary and they gave him some of the most memorable hits of his career: “Suspicious Minds,” “In The Ghetto,”, “Kentucky Rain,” and more. Elvis never sounded more connected with his music – there was a rasp in his voice that came from the soul and every word he sang sounded like the gospel. Not only did he return to TV and the studio, he also made his return to live performing. Those first 1969 shows in Las Vegas are now legendary. When he returned to Vegas in '70, his engagement was filmed for the movie That’s The Way It Is. On top of the Vegas gigs, he began touring the U.S. again. To top it all off, he returned to the studio and, although not as ground-breaking as the ’69 recordings, his studio work still sounded like he was connecting to his music again. Elvis had never been more alive, more real and more in touch with his audience. The excitement lasted throughout ’71 before more changes began taking place. Next to the soundtrack recordings, his ‘70s output is the most misunderstood phase in Elvis’ career. Although this period started out well – “Burning Love” and “Always On My Mind” are two of his greatest singles – things went slightly askew, commercially. Record buyers wanted more Rock 'n' Roll from Elvis, but he seemed more interested in 'entertaining' than rocking. His choice of live material included recent Pop hits alongside the songs he was best known for. In fact, his live set lists began to feature the same type of material that adult contemporary artists like Andy Williams, Dean Martin, and Perry Como would include in their own concert performances. His recorded output began to suffer as well. While most artists went into the studio to record an album, Elvis headed in to record as many songs as possible in a short period of time - his manager Colonel Tom Parker and RCA would then take those songs and spread them out over a few albums plus a couple of non-album singles. During this period, Elvis seemed to put his heart and soul into the types of songs he really connected with - the ballads, the Country songs and Gospel favorites. Elvis' voice still sounded great but he wasn't always offered the greatest material (due to publishing issues that you can read about elsewhere.) However, when Elvis did actually connect with the material, he made that song his own. Every one of his '70s albums contains classic songs and performances, although there are some tracks that are best left only heard once. 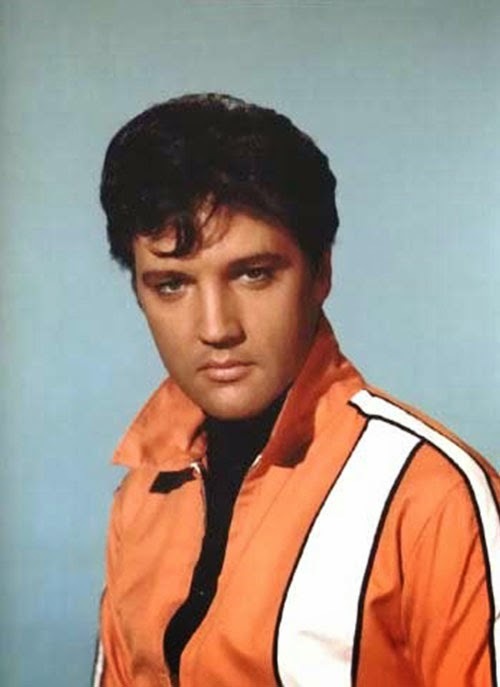 However, he was still an extremely popular artist and his Madison Square Garden concert in ’72 and the Aloha From Hawaii satellite broadcast were two of the most celebrated highlights of his career (although this writer considers Elvis' performance on the Aloha special to be uncharacteristically reserved). Behind the scenes, things were changing. Rock radio stopped playing his singles around ’73, although he was still being played on Country stations. In ’75, he seems to have regained some of his energy on the Today album, but by this time, the momentum was slowing down. From that point, Elvis couldn’t be bothered to enter a studio anymore – his final two albums, From Elvis Presley Boulevard… and Moody Blue, were recorded at Graceland in his Jungle Room. A dependence on prescription drugs and a never ending touring cycle wore Elvis down. On August 16th, 1977, it all came to an end. He was only 42. In Elvis' final years, he couldn't get a record into the Pop or Rock charts, although Country radio still played his latest releases. Concert attendance was stil good, but record sales were dwindling. However, when he died, sales on Elvis' catalog went through the roof. 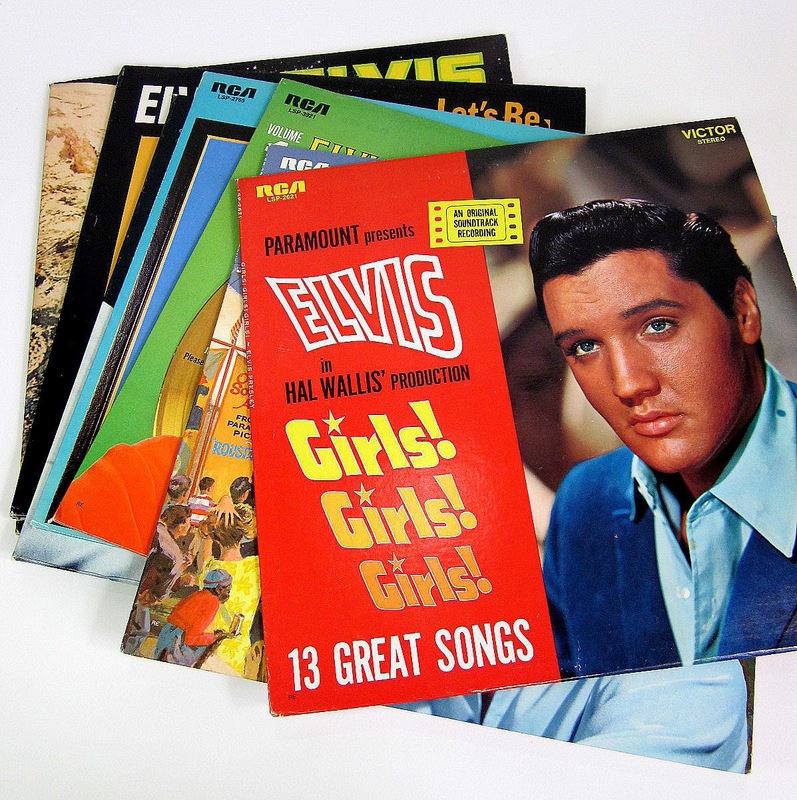 Entire record pressing plants had to set aside other projects in order to keep up with the demand for Elvis' albums. Elvis probably sold more records than any other artist in the world over the next year or two. Over the years, Elvis has released more albums posthumously than he did when he was alive. As long as there is interest in his music there will always be reissues and repackages. In fact, the official Elvis collectors label, Follow That Dream (via BMG), has released amazing digitally remastered and expanded editions of all of his studio albums as well as loads of previously unreleased live shows. There's never been a more exciting time to delve deeper into his catalog than now! There is so much great music to be explored. The king is dead. Long live Elvis! Great piece! Long Live The King!